I have the distinct impression that our postman has a little red van rather than a coach and four, but I'm sure the effect is the same. Look at them, boldly galloping on through the snow in order to bring me my books and DVDs! 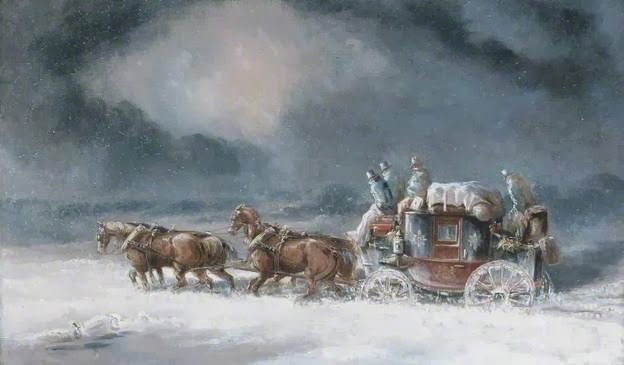 Look at the gentlemen, perched like ice sculptures on the outside of the carriage, nobly delivering the mail, though the roads be treacherous and the wind sharp as a blade! Hurrah for Postmen! Okay, when I said 'different' I obviously meant 'absolutely the same'. 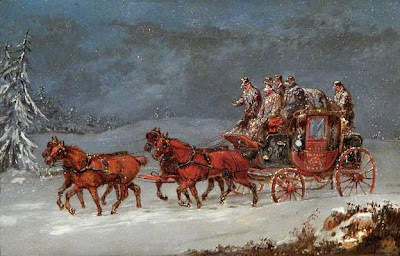 Splendid red coach in this one, striking a lovely note with the russet beauty of the four horses. Everyone looks a little less like ice-lollies in this image and I think there is a good chance all of these postmen will live. Hurrah! Hello, we have something a bit different here. For starters, there are six horses. Or at least, there were. I'm sure the horse is just having a bit of a sit down and will jump up at any moment to continue his happy trotting. Or something like that. I love the shine on the horses, it contrasts so nicely with the softening effect of the snow on the landscape. They have the sheen of conkers, it's absolutely beautiful. It does make you wonder at the cost to human and animal life, getting post back and forth in such cold weather. I'm guessing that no animals are harmed in the delivery of my parcels from Amazon, The Book People, Lakeland and Lindybop, which is a relief. I think if I had to pick a favourite, I'd go for the middle one because it is such a jolly scene, no-one is 'having a rest' and the colours are so rich. It reminds me of the sort of thing my Grandmother would have had on her wall or on placemats. A scene of the past with nostalgic overtones. Unless you got the print with the dead horse in it. Lawks, that's enough to put you off your Christmas dinner. Poor horse. 'No animals are harmed in the delivery of my parcels from Amazon'. That depends entirely on whether you think Amazon's warehouse staff are animals or not. Clearly Amazon thinks they are. 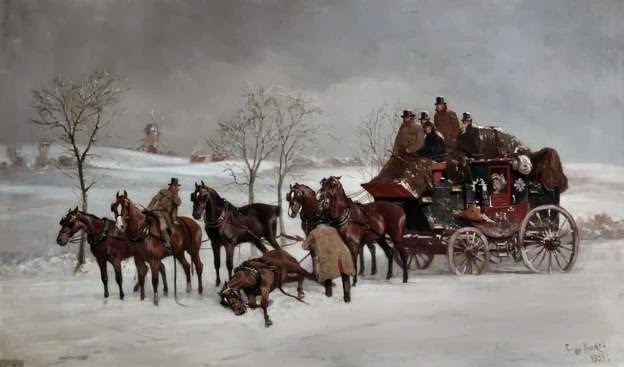 They are paid the minimum wage, walk fifteen miles per shift, are kept on their toes by overseers armed with rhino-hide whips and cattle-prods, and are laid off straight away after Christmas. Compliments of the season! I know, I know. I've bought all my pressies online as well. I know Amazon are evil, but they also publish my book. Swings and evil roundabouts, sadly. You are a hireling of Satan. I just wish he'd offer me a salary. My grandmother grew up on a farm and proudly told me she could drive a pony and trap ... somehow this got conflated in my young mind to a coach-and-four, or coach-and-six as in Dickensian dramas, Hammer Horror, and this seasonal post. Clever choice. "Hurrah for postmen!" indeed, and we only asked to be tipped once a year as well, not for ten minutes work like waiters and taxi drivers!